So much yarn, so little time. 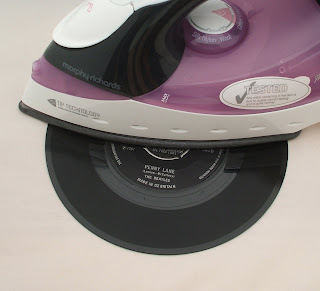 : Ironing my Beatles...would you? Could you? Mr Nifty is gradually transferring our vinyl records (bear with me youngsters, they're like CDs but bigger) onto CDs. But some of them are *quite* old, and weren't treated so well over the years. This one has a definite warp and is quite unplayable - yet as i saved up my pocket money back in 1967 to buy it, I'd really like to try to rescue it. There's nothing quite like the crackle and hiss of an original! So what do you reckon - if I stick it under a cloth and run a hot iron over it, what will happen? And on another subject - you know how one thing makes you think of another? I first heard this in a folk club in the 70s - had no idea it'd be on youtube! Heather I'm not sure it will work!! But if it does maybe make a clock out of it, I don't think it will play to well!! LOL Very funny!! Good point Sheryl - I hadn't even considered what might happen to the iron! ALD - it's not the scratches, it's the wonderful loopiness of the warp! Yellowbug...I'm in the UK. Sunshine is a foreign concept to us ;-) I love the guy's explanation though "using your knowledge of the atom world"
hehe... I remember my parents making a fruit bowl out of a Perry Como record... I think that involved a kettle-full of boiling water! Lisa that was one of my other ideas!